Deadlocking renders the exterior and interior door controls inoperative. It also deactivates the manual central control button. 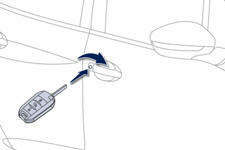 Turn the key to the rear in the driver's door lock to lock the vehicle completely. Turn the key to the rear again within five seconds to deadlock the vehicle. Press the closed padlock again within five seconds to deadlock the vehicle. Deadlocking is confirmed by fixed lighting of the direction indicators for approximately two seconds. Depending on version, the door mirrors fold at the same time. First press this button to fold the key. 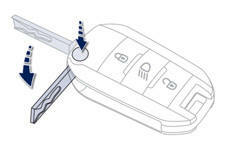 If you do not press the button when folding the key, there is a risk of damage to the mechanism.